After a very successful 2011 TORQ triathlete Louise Bardsley is credited with ‘most improved athlete’ at the Reading Sports Persoanlity of the Year awards. The annual Reading Sports Personality Awards took place on 15th January 2012, and celebrated a record-breaking standard of nominations in this Olympic Year. Louise was honoured to have been nominated by Thames Valley Triathletes, for the accolade of Sports Personality of the Year 2011. The highlights of her year included winning the British (Age Group) Triathlon Championships at Dambuster; taking 5th place overall in the World Duathlon Championships in Gijon, Spain (with a Silver medal in my Age Group) and – closer to home- winning the Reading Triathlon by 14 minutes, beating the course record (and all but 8 of the men!) in the process. She was up against some tough competition – with 28 other nominations of international standard, and 240 nominations in total. The winner was voted for by the organising committee. The main award of the night went to England hockey star and GB Olympian Alex Danson and Louise was delighted to receive a shared award for most improved athlete of 2011. 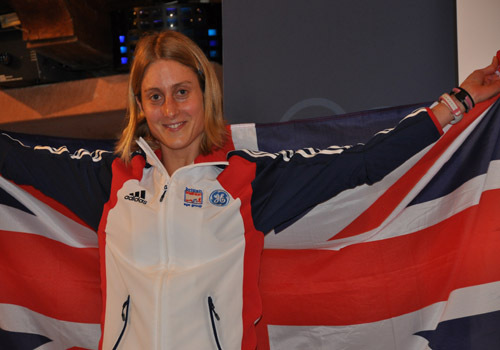 So it’s onwards and upwards for 2012 – Louise suggests that there are plenty more improvement still to come!